Burgess K.B., Couturier L.I.E., Marshall A.D., Richardson A.J., Weeks S.J., Bennett M.B. (2016) Manta birostris, predator of the deep? 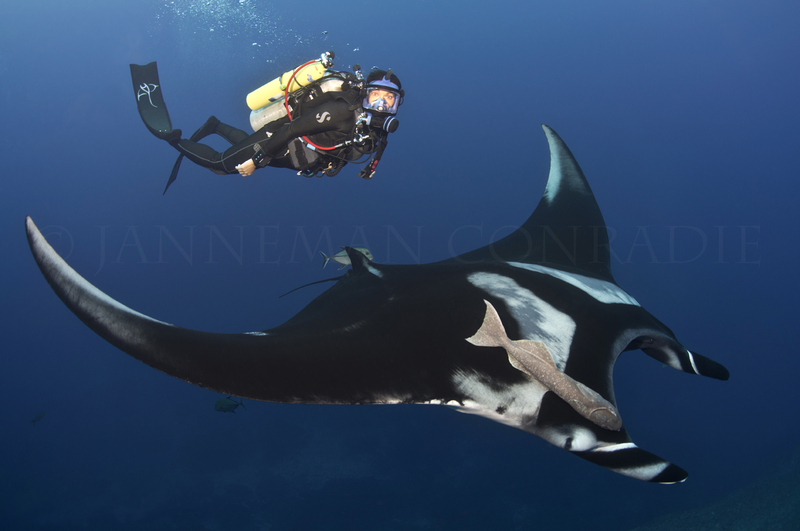 Insight into the diet of the giant manta ray through stable isotope analysis. Royal Society Open Science 3: 160717. Croll DA, Dewar H, Dulvy NK, Fernando D, Francis MP, Galvan-Magana F, Hall M, Heinrichs S, Marshall A, McCauley D, Newton KM, Notarbartolo-di-Sciara G, O’Malley M, O’Sullivan J, Poortviet M, Roman M, Stevens G, Tershy BR, White WT (2015) Vulnerabilities and Fisheries Impacts: The Uncertain Future of Manta and Devil Rays. Aquatic Conservation: Marine and Freshwater Ecosystems. http://dx.doi.org/10.1002/aqc.2591. Kashawagi T, Marshall AD, Bennett MB, Ovenden JR (2012) The genetic signature of recent speciation in manta rays (Manta alfredi and M. birostris) Molecular Phylogenetics and Evolution 64: 212-218. Marshall AD, Kashiwagi T, Bennett MB, Deakos M, Stevens G, McGregor F, Clark T, Ishihara H, Sato K (2011) Manta alfredi. In IUCN 2011. IUCN Red List of Threatened Species. Version 2011.2 <www.iucnredlist.org>: IUCN 2011. IUCN Red List of Threatened Species. Version 2011.2. Marshall AD, Bennett MB, Kodja G, Hinojosa-Alvarez S, Galván-Magaña F, Harding M, Stevens G, Kashiwagi T (2011) Manta birostris. In IUCN 2011. IUCN Red List of Threatened Species. Version 2011.2 <www.iucnredlist.org>: IUCN 2011. IUCN Red List of Threatened Species. Version 2011.2. Marshall AD, Dudgeon C, Bennett MB (2011) Size and structure of a photographically identified population of manta rays Manta alfredi in southern Mozambique. Marine Biology 158(5): 1111. Kashiwagi T, Marshall AD, Bennett MB, Ovenden JR (2011) Habitat segregation and mosaic sympatry of the two species of manta ray in the Indian and Pacific Oceans: Manta alfredi and M. birostris. Marine Biodiversity Records 4, e53. Rohner CA, Richardson AJ, Marshall AD, Weeks SJ, Pierce SJ. (2011) How big is the world’s biggest fish? Measuring whale sharks with laser photogrammetry. Journal of Fish Biology 78: 378-385. Marshall AD, Bennett MB (2010) Reproductive ecology of the reef manta ray (Manta alfredi) in southern Mozambique. Journal of Fish Biology 77: 169-190. Marshall AD, Compagno LJV & Bennett MB (2009) Redescription of genus Manta with resurrection of Manta alfredi (Krefft,1868) (Chondrichthyes; Myliobatoidei; Mobulidae). Zootaxa 2301: 1–28. Marshall AD (2009) Biology and population ecology of Manta birostris in southern Mozambique. PhD Thesis, University of Queensland, School of Biomedical Science. Marshall AD, Kyne PM, Bennett MB (2008). Comparing the diet of two sympatric urolophid elasmobranches (Trygonoptera testacea Müller & Henle and Urolophus kapalensis Yearsley & Last): evidence of ontogenetic shifts and possible resource partitioning. Journal of Fish Biology 72: 883-898. Marshall AD, Pierce SJ, Bennett MB (2008) Morphological measurements of manta rays (Manta birostris) with a description of a foetus from the east coast of Southern Africa. Zootaxa 1717: 24-30. Pierce SJ, White WT, Marshall AD (2008) New record of the smalleye stingray, Dasyatis microps (Myliobatiformes: Dasyatidae), from the western Indian Ocean. Zootaxa 1734: 65-68. Speed CW, Meekan MG, Rowat D, Pierce SJ, Marshall AD, Bradshaw CJA (2008) Scarring patterns and relative mortality rates of Indian Ocean whale sharks. Journal of Fish Biology 72: 1488-1503. Couturier LIE, Marshall AD, Jaine FR, Kashiwagi T, Pierce SJ, Richardson AJ, Townsend KA, Weeks SJ, Bennett MB (2012) Biology, ecology and conservation of mobulid rays, Mobulidae (Gill, 1893) Journal of Fish Biology 80: 1075-1119. Marshall AD, Pierce SJ (2012) The uses and abuses of photographic identification in sharks and rays. Journal of Fish Biology 80: 1361-1379.